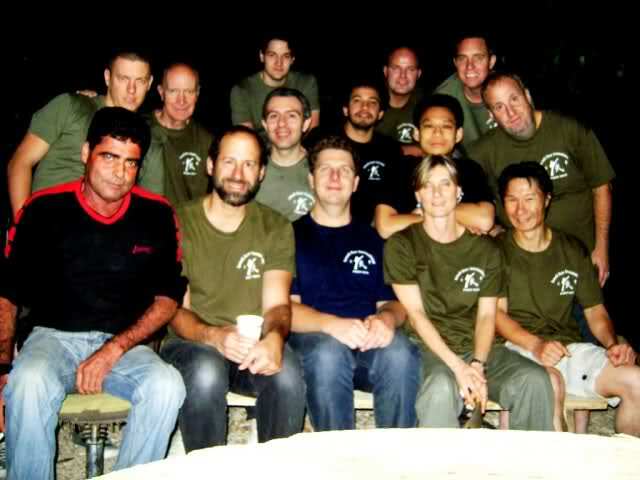 Tour and Train November 28 - December 8, was our largest group ever and our longest training period. It began early Sunday morning. Our South African contingent arrived first; Tyler and Alan, Grant (or Gront as he says it), Mike and Alex. Soon others arrived, all ready with their training gear. Adrian from Canada, and then Jhoan from Mexico. Scott from Miami, USA, was right on time, and soon Michal from Poland walked in as well. Truly an international contingent. The next morning we were joined by my group friend Stephan from Heidelberg, Germany (second Tour and Train and fourth seminar overall). Soon we would be joined by Roberto from Italia. Each day began with coffee and interesting discussions. 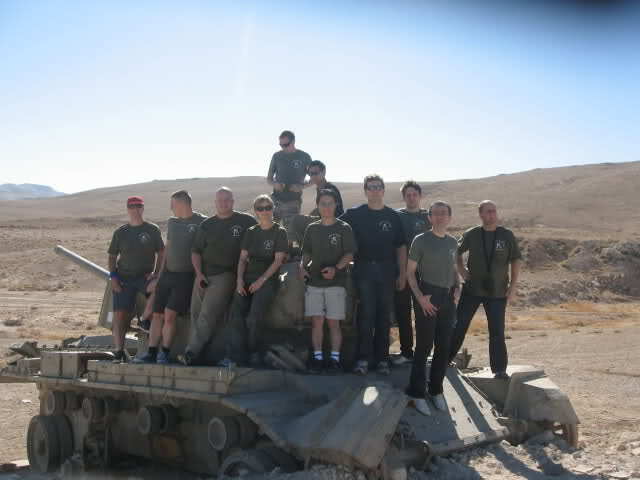 Everyone had something to contribute, about self defense, Israel, philosophy, life. 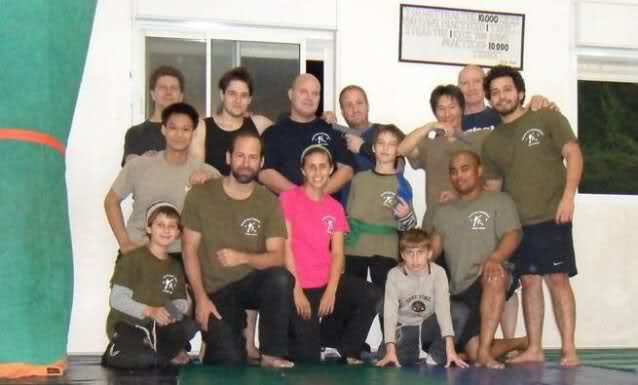 Then we went downstairs for Krav Kicking, punching, blocking, striking. After a good workout we took a lunch break at 1 p.m. got into our cars and taxis and headed out to Adumim Mall where Morris and Yosi treated us to wonderful food each day. Nearly everyday we enjoyed a great Middle Eastern lunch at "Barbecue" at the Maaleh Adumim mall. Here we are with Morris, (white shirt, black apron) who prepared a great lunch for us everyday. 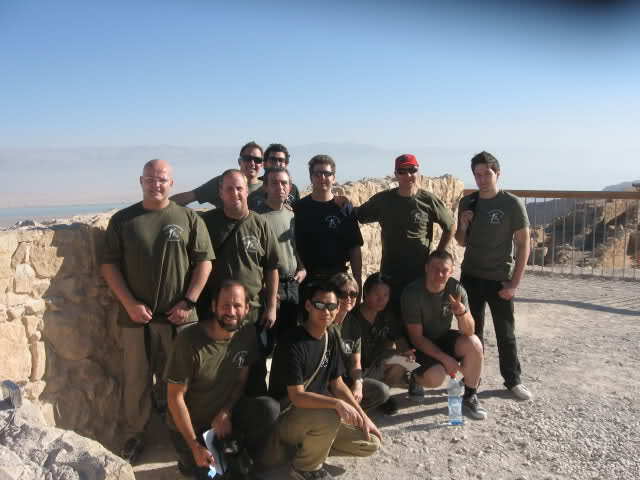 We learned a great deal about the fighting history of Israel and visited the fortress on Mt. Masada where 960 Jewish man, women and children held out against over 8,000 Roman legions. The siege ended tragically in the year 73-74 C.E. Jhoan from Mexico delivers a powerful kick. 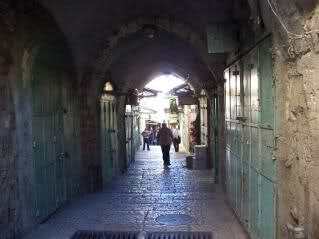 Jerusalem, Old City, Muslim Quarter. We studied the history of Jerusalem and visited sites of historical and religious significance for Jews, Christians, and Muslims. We visited the Western Wall, Jerusalem. Most of the wall is not visible as it is underground, but there is a spot where we were able to look down and see just how far it extended. The oldest stones date back to the time of King Herod, 19 B.C.E. and weigh as much as 570 tons. Mike and Allison, working on dinner for the group. Lunch we eat at the mall or other places and dinner we cooked at home. First Tracy and after she left, Allison, took over the kitchen, delegating tasks and making a meal out of whatever we happen to have around. It always came out great and was a lot of fun. A real family! On the way home. Alan, Grant and Tyler, relaxing at Ben Gurion airport on their way back to South Africa. Until next time guys! It was truly a blast. 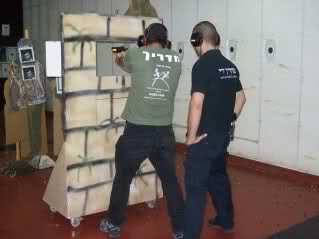 Moshe doing some combat shooting. 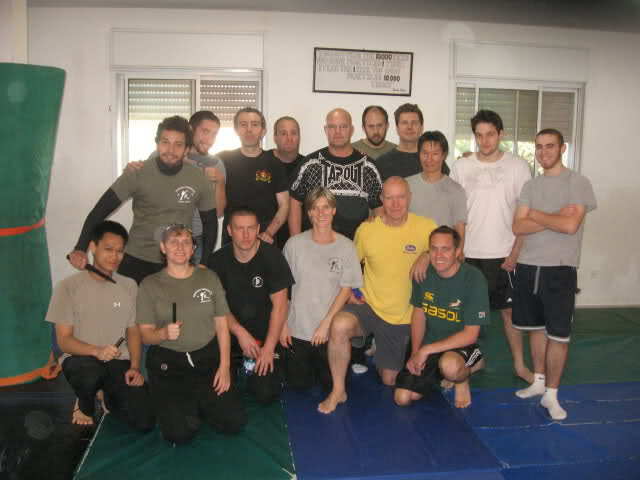 Before coming to Israel to train Krav Maga with you I did not know what to expect. After having the honor of training with you, you exceeded all my expectations. The atmosphere was warm and friendly and the training both hard and challenging to both mind and body. I can’t last remember when I have been so sore and tired, but loved every moment of it. Your Krav Maga techniques are simplistic, yet extremely effective. What I liked most about them is they all initiate from a natural body threat reaction, unlike other Martial Arts that require some sort of defensive preparation before hand, so all your techniques flow like water in to each and are able to over whelm an opponent even before he/she can comprehend what is happening. I also like the fact that a single technique works the same, whether it be for left, right or mid section attacks. 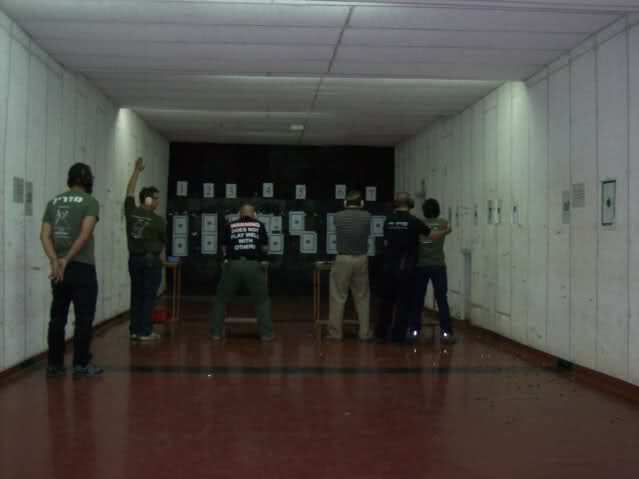 Usually the norm is for one to execute different techniques for left, right and mid section attacks which while under pressure, thought process can prove to be very confusing and difficult. With the techniques you showed me all I have to do is react and it does not matter if the attack is from the left, right or to the midsection the same defensive move applies and works effectively in all the above scenarios. I am very impressed with this unique technique concept of yours and think this is the path all other Martial Art techniques should follow. It was also great to be able to tour and learn a little about Israel and the Jewish history and customs. I especially enjoyed spending the celebration of Hanukah with you and the group. Thanks for everything Moshe and I look forward to seeing you next year in South Africa. 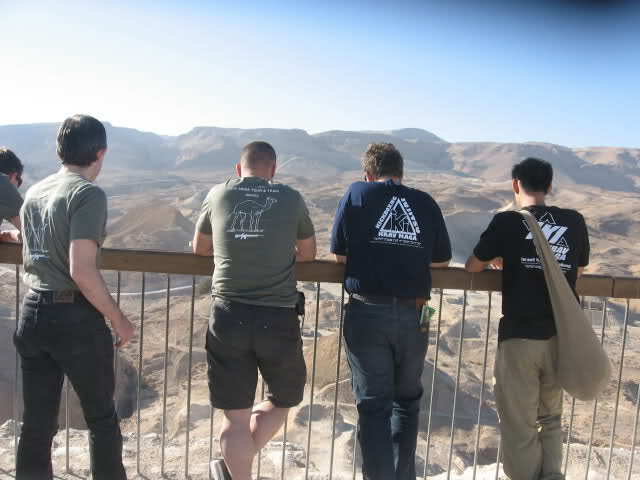 Thank you again for our time in Ma’ale Adumim, we all had such a wonderful time. The gun and knife disarms are much superior to what we have been teaching up until now.